Officials say Ohio’s unemployment rate has taken its biggest one-month drop in nearly 30 years amid improvement in the state’s job market and overall economy. The Ohio Department of Job and Family Services said Friday that joblessness fell in November to 8.5 percent, from an even 9 percent in October. The best news is that Ohio’s drop in unemployment was larger than the drop in the national rate. That means Ohio is recovering faster than the rest of the country. Of course, that should be no surprise to us here. We’ve been bringing all of the governor’s efforts to your attention from day one. Recently, we’ve seen a flurry of announcements as those policies are really starting bear fruit. And the ride isn’t slowing down. Just yesterday, Total Quality Logistics announced they will add 575 brand new jobs at their location in Clermont County’s Union Township. 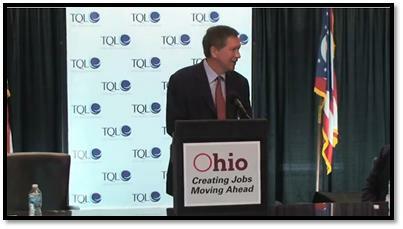 Ohio competed with another state for those jobs, but the Kasich administration won them for Ohio. And for those who bemoan that tax incentives are “corporate welfare”, the state will recoup those funds in the equivelent of one short year. TQL Executive Vice-President Kerry Byrne said Kentucky put together a good package, but in the end the firm agreed to amend its job creation tax credit package with Ohio. That’s not welfare, folks. That’s a winning investment for Ohioans. In other good news, the company will build 100,000 square feet of new space for the expansion. That will, of course, provide plenty of construction work, as well. Governor Kasich and his administration know there is still a long way to go. But what a difference an attitude makes. When you go out and court businesses, and let it be known throughout the country that Ohio is serious about doing business with them, results happen. When you recognize that something isn’t working and implement changes to fix it starting from day 1, that’s leadership. It’s a serious breath of fresh air and change in posture from the previous administration who thought Ohio’s development department was doing just fine, even as Ohio bled 400,000 jobs. “A new way, a new day” sounded to some like a corny campaign slogan last year. But this governor is making it a reality.